"Lock down this boat right away!" Saban Films has debuted an official trailer for another one of these super cheesy action movies titled Black Water, which is the feature debut of a cinematographer named Pasha Patriki. The title of the film relates to the setting of the film - a submarine which is actually a CIA black site (meaning: a secret place where deep, dark things happen). The plot involves a deep cover operative who awakens to find himself imprisoned there, and then eventually discovers another prisoner while attempting to escape. The big selling point is that this stars two big action legends: Jean-Claude Van Damme and Dolph Lundgren. The rest of the cast features Al Sapienza, Jasmine Waltz, and Patrick Kilpatrick. This looks as bad as it sounds, even with these two guys in it, but maybe it's a fun time with friends & beer. Action-movie icons Jean-Claude Van Damme and Dolph Lundgren deliver a double shot of adrenaline-fueled excitement in this heartpounding undersea thriller. 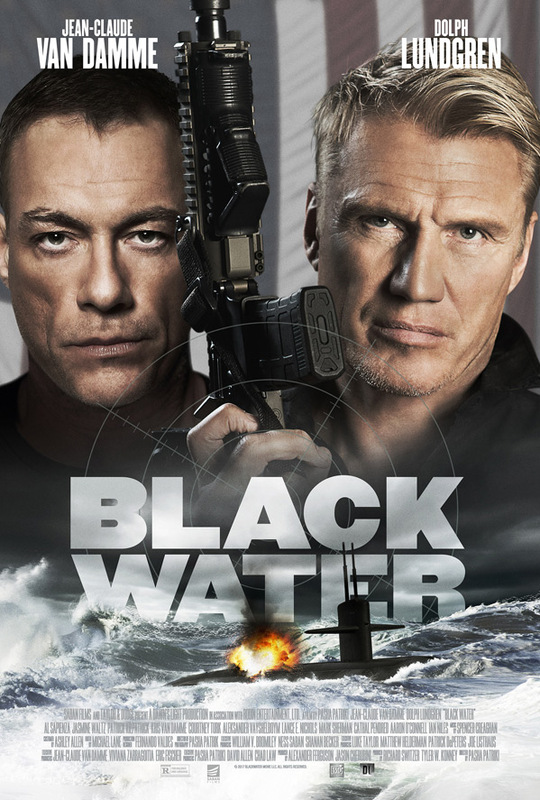 After a failed mission, deep-cover operative Wheeler (Van Damme) is imprisoned in a CIA black site on a submarine. The CIA agents will to go to any lengths to get information from Wheeler—but nothing can prepare them for the storm of violence that erupts when he joins forces with a fellow prisoner (Lundgren) as deadly as he is mysterious. Black Water is directed by Canadian filmmaker Pasha Patriki, a veteran cinematographer and camera operator making his feature directorial debut. The screenplay is written by Chad Law, from a story by Chad Law, Tyler W. Konney, and Richard Switzer. The film will go straight-to-DVD in most of Europe this month. Saban Films will release Black Water in select theaters + on VOD starting June 29th this summer. How does that look?